The guide book is now available for purchase online RIGHT HERE, BABY! A few months ago three friends and I decided that what visitors to Copenhagen needed was a decent guide book. Not one written by a tourist who passed through the city for a week and published in foreign countries, but rather one written by locals. An insider's guide to all the nooks and crannies you don't hear about in Rough Guides, Lonely Planets and brochures from the tourist information office. We launched Copenhagen Cycle Tracks a week ago and we're well pleased. 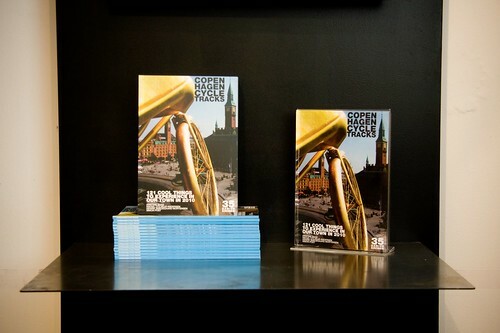 The book is a collaboration between Cycle Chic and Baisikeli Bike Rental. The latter is a development agency that sends used Danish bikes to workshops in Africa and if you're ever in Copenhagen, this is where you rent your bike. Got it? The book is written by me, Henrik Smedegaard Mortensen, Kristine Baas and Simon Post. I did the art direction and took most of the photos. Each of us have chipped in with personal recommendations, identifiable with a colour code. Want to see which beach Mikael recommends? Look for the red boxes. Keen to see which bars Kristine fancies for a night out dancing? Look for the purple. And so on. It is available from Baisikeli, the tourist information office and selected hotels and youth hostels. It costs 35 kroner - cheaper than a pint of beer. In a way it's a bicycle guide to the city, but then again, not really. The bicycle is the preferred transport form so it's kind of silly to write a bicycle guide. We have a page with cycling tips, but other than that we're expecting people to use the bicycle to get around to the 121 exciting places. When in Rome, as they say. To celebrate the launch of the book we went for a bike ride with 50 friends last night. I'll blog about it shortly. If all goes according to plan we'll do it again next year, complete with mobile phone apps and a website. I might move to Copenhagen ! 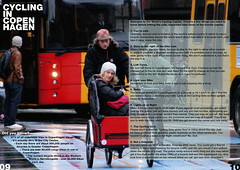 It's great what you are doing for the bike culture in Copenhagen and elsewhere. I'm fan of your website! 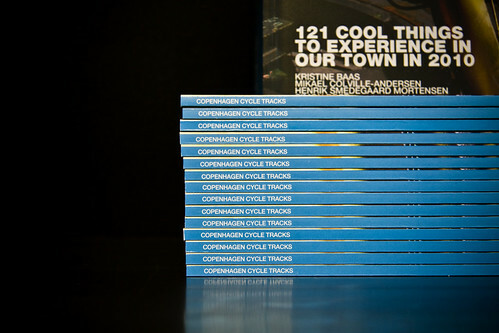 I must go to Copenhagen to see it and of course buy the bikeguide. I am off to Copenhagen next month and cycling is the way I'm planning to see the city. I was just thinking this morning that I needed to find a way of getting some local info on the best places to go - this will be perfect. Excellent timing! congratulations! Can I get one sent to New York? What a delightful city ! My friend got one last week while her parents were visiting. Now they're gone to Italy- with the guidebook! I'll have to come by and buy one myself! how would a Yank get hold of one of these books? Looks grand! Nice work. 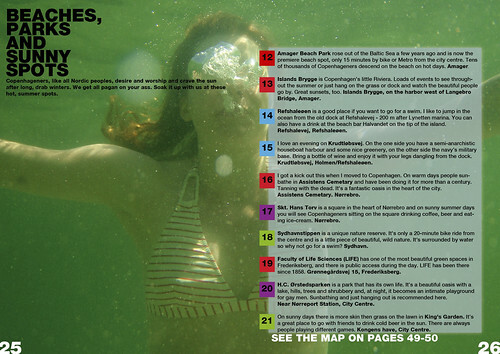 I'll be in CPH next week and this guide looks it will be my pocket pal to visit every corner in town. great news and way to go! i pray one day (very soon when the weather is warm)to visit your country with my folder. i'll keep this post in mind for all the great spots the hit. peace! We leave for CPH in a week...great timing! We will of course buy the book. Would love to meet you while in your city, perhaps at the cargo bike race? Have you seen this CPH guide? I love visiting the sites that only the locals know about as opposed to the usual tourist destinations. Maybe I need to create one for Flagstaff. We're coming back to CPH this July and will definitely pick one up when we get our bikes at Baisikeli. Thanks for this! We're coming to Copenhagen for the summer. Where can we get one of these books in the UK? We bought your book and used it as our main guidebook for a three day stay in the capital. It was our first time and we swapped flats with some Copenhageners living right in the centre of town. They also let us borrow their bikes so we explored the city using their bikes and your book. We really enjoyed having all the local knowledge and were really quite surprised when we went into the city centre and came across lots of tourists, as we'd been hanging out in the neighbourhoods! Your book was great and I only have one recommendation for the next version - several of the authors' recommendations talk about a green cycle route. We never did find out exactly where this went or how to identify it. It might be useful to explain it and show it on the maps? thanks, v&b! duly noted. corrected next year. thanks!